The theme for National Minority Health Month 2018 is “Partnering for Health Equity”. 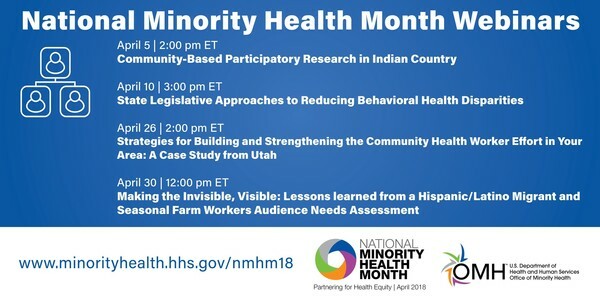 On April 17, the Office of Minority Health (OMH) at the US Department of Health and Human Services (HHS) sponsored the National Minority Health Month Observance, during which leaders highlighted collaborations at the federal, state, local, tribal, and territorial levels focused on health equity. During the event, Dr. Lin was joined by leaders from the HHS Office of the Secretary, Office of the Assistant Secretary for Health, Indian Health Service and National Institute on Minority Health and Health Disparities. As a part of National Minority Health Month, OMH developed an online toolkit available for use in creating ongoing awareness. Vice Admiral Jerome M. Adams MD, MPH, Surgeon General of the United States, shared his insights into the importance of public health in this recent blog post during National Public Health Week. In his post, Surgeon General Adams says, “When we are addressing issues that are important to improving our nation’s health, we cannot operate in silos. Whether we are looking to improve our nation’s health outcomes, improve our national security, or enhance a community’s resilience, we need partnerships and collaboration. We can only change our future together." Several of the NPA’s regional health equity councils (RHECs) are convening their annual review and planning sessions (ARPS) this spring. In addition to reviewing recent accomplishments and planning efforts for the coming year, each RHEC welcomes new members and elects new leadership. In April, the Great Lakes RHEC held its ARPS in Milwaukee, Wisconsin, and the New England RHEC and RHEC II came together for a joint meeting in Cherry Hill, New Jersey. The NPA Winter 2018 Newsletter is still available. As part of its commemoration of National Minority Health Month, the NPA interviewed Daniel Dawes, a nationally recognized leader in the health equity movement who has led numerous efforts to address health policy issues impacting vulnerable, underserved, and marginalized populations. Mr. Dawes is the co-founder of the Health Equity Leadership and Exchange Network (HELEN), a national network of health equity champions in virtually every state and territory and a partner of the NPA. He is also the Executive Director of Health Policy at Morehouse School of Medicine, in Atlanta, Georgia, leading the institution's health policy initiatives and serving as Senior Advisor and General Counsel to the Satcher Health Leadership Institute. In this blog post, Daniel discussed the health equity movement and partnership for health equity. Did you miss an NPA Blog post by an RHEC member? Find it in the recent announcements. This webinar will outline crosscutting strategies that can support more inclusive and accessible approaches to implementing Healthy Communications and Health Information Technology (HCHIT). Presenters will share ways to engage the disability community to meet the needs and preferences of people living with disability, and they will provide an overview of progress on related objectives among people with disabilities. They also will provide an overview of tools supporting civil rights of persons with disabilities that can be used to further HCHIT goals and objectives. May 16, 2 pm ET. Check the Mountain States RHEC website for the registration link, which is forthcoming. This webinar will focus on Baltimore’s efforts to galvanize the faith-based community to help prevent violence and address trauma. Webinar participants will be able to identify how violence leads to trauma and the complex challenges to address trauma in minority communities. The presenters will discuss faith-based or community models that faith and spiritual leaders and providers can utilize to address trauma. They will also enumerate how to systematically integrate faith-based leadership into violence prevention and other public health programming. May 21, 1:00 pm ET. Check the Mid-Atlantic RHEC website for the registration link, which is forthcoming. 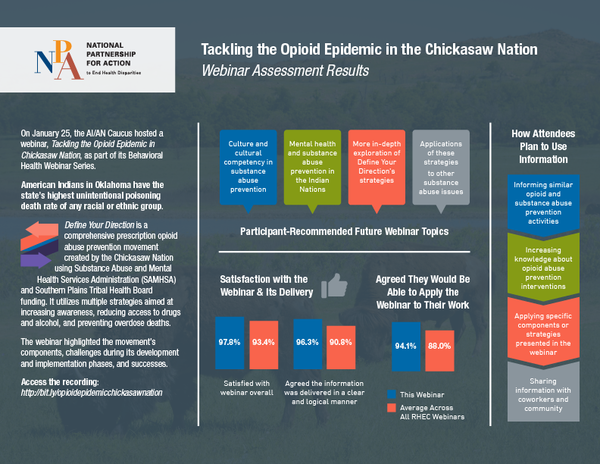 This webinar will highlight Buncombe County’s efforts to use the Collective Impact Model to leverage partnerships, funding, and community-based strategies to address this health disparity. Using this model, this North Carolina county’s HHS invests in strategic partnerships as a key strategy to ensure programs are designed for sustainability, speak to community aspirations, and incorporate authentic community engagement. May 23, 3:00 pm ET. Check the NPA RHEC website for the registration link, which is forthcoming.